Aprille's Danceprints, LLC offers a variety of classes that your child can take in respect to their age group and skill level. A class that combines Jazz, Acrobatics and Ballet, focusing on basic primary dance skills, interaction with other children, appreciation of music and introduction to rhythms and basic motor skills. A class that combines Tap and Tumbling, focusing on teaching children to hear rhythm through their own tap sounds, interaction with other children, appreciation of music, introduction to rhythms and basic motor skills. This class is a MUST for all beginning students. An introduction to Ballet basics for beginning students. A class with an emphasis on rhythm, coordination and balance. Classes range from beginner to advanced to match everyone's abilities. A high energy class incorporating a wide range of styles set to music. Classes range from beginner to advanced to match everyone's abilities. A class that focuses on stretching, flexibility and strength. Trick progression ranges from basic tumbling to advanced aerial maneuvers. A structured class teaching discipline, technique and proper placement of the body. Ballet is the foundation for all forms of dance and is mandatory for advancement in all other classes. Classes range from beginner to advanced to match everyone's abilities. Advanced ballet work. Requires a minimum of one year advanced ballet placement, and recommendation from the instructor. The stylized rhythmic dance that commonly accompanies Rap and Hip-Hop music. Classes range from beginner to advanced to match everyone's abilities. A combination of Ballet and Jazz with an emphasis on dancing to the feel of the music. It is a free flowing art form that challenges the student's creativity and pushes them to connect to the dance physically as well as emotionally. Two years of ballet is REQUIRED before taking contemporary. In respect to each class, there is a MANDATORY dress code that must be followed by all attending students. You can find all of these required items at your local dance apparel stores. THERE ARE TO BE NO JEANS/STEET CLOTHES WORN TO CLASS; STREET SHOES SHOULD NOT BE WORN ON THE STUDIO FLOOR! Comfortable dance apparel, leotards and tights are optional, tights should be footless for the tumbling portion of the class, and any dance skirts should be removable. Pre Dance shoes need to be pink ballet slippers. Pre Tap shoes need to be black patent leather, Mary Jane style tap shoes. Leotard and tights are REQUIRED. Tight fitting shorts may be worn over the leotard for class. Pink leather, split sole ballet slippers MUST be worn. Comfortable dance apparel, leotards and tights are optional. Black, lace-up Capezio tap shoes. Mary Janes are no longer appropriate for class. Comfortable dance apparel. Bare feet is a must! NO SHOES! Pointe shoes are similar to the pink leather slippers, but have a harder toe so the dancer can perform proper pointe technique can be achieved. Students are selected by invitation for the competition team based off of their outstanding technique, exemplary attendance, stage presence and positive attitudes. Ballet training is MANDATORY for any student invited and willing to join the competition team. Our competition team focuses in competing dances in Tap and Jazz, but can expand into other styles depending on our dancers and instructors. For many years, our competition teams have won numerous trophies and special awards in Connecticut, Massachusetts and New York. 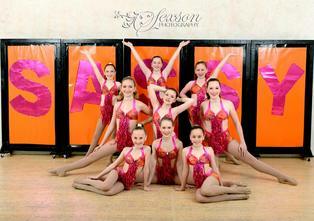 This team encourages good sportsmanship and enables our students to further develop their dance skills. Competing also gives Aprille's Danceprints, LLC the wonderful opportunity to showcase our talented dancers in a regional environment. It is truly a privilege to be a part of the competition team, as our other dancers look up to them for inspiration and positive feedback.